Supported by an Art Fund Jonathan Ruffer curatorial award and National Museums Scotland, this April I returned to Blantyre in Malawi to continue work on a collecting and research project for the World Cultures African collections, working with Emmanuel Mwale from Museums of Malawi (MoM). The fieldwork had two strands: to collect the Malawian cloth known as chitenje (pl. kitenje), for the museum and to gain a greater understanding of the cultural significance of this cloth in Malawi today. A chitenje is a length of patterned cotton cloth worn around the waist as a wrapper by many women every day in Malawi. Whilst this cloth is produced in a wide range of patterns and colours, my focus was on a range of cloths commissioned by the political parties and churches, which is distributed free (political) and sold to the public (church), and worn as an expression of support and unity. There is a high level of interest in national politics amongst the general public in Malawi. With the General Election planned for 20 May 2014, there was significant activity in the run up to the election with rallies, campaigns and newspaper, television and radio coverage from all the main political parties in Malawi. Political cloth is distributed during campaign rallies as an incentive for party support. Meetings at political party headquarters in Blantyre were arranged for all the main parties who will be contesting the election: People’s Party (PP), who are currently head of government; People’s Progressive Movement (PPM); Malawi Congress Party (MCP); Democratic People’s Party (DPP) and United Democratic Front (UDF). One of the highlights was an invitation to the Malawi Congress Party (Southern Party) headquarters in Blantyre to record the local women’s groups dancing and singing competition, to decide who would be representing the party at the election campaign launch in the capital Lilongwe. We collected donations of cloth from all the above. 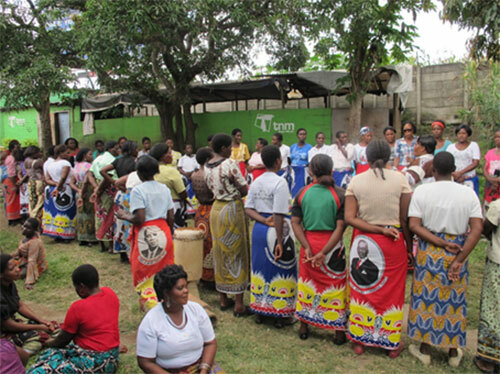 Malawi Congress Party female dance groups practise for campaign rally performance, 3 April 2014. In Malawi a very high proportion of the population regularly attend church and a large range of cloths are commissioned by the churches. These can range from celebrations for the inauguration of a new church building to commemorating a saint’s day; from new appointments of the clergy to annual church festivals including gospel singing. 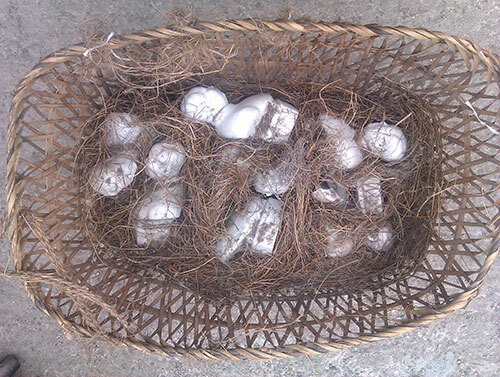 These are sold to members of the church to generate income for church funds. During meetings and visits to a number of the local churches including Blantyre Synod Church Central Africa Presbyterian (CCAP); Seventh Day Adventist Church, Soche; Anglican Church Diocese Headquarters and Catholic Cathedral in nearby Limbe, it was clear that the church women are very active in the design of the cloths and emphasised the central role of church cloth in the expression of women’s community identity. This was very evident from the groups of women seen about, wearing the same designs, clearly and proudly identifying them with their local church. 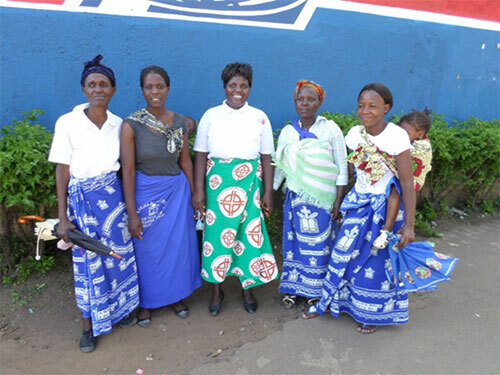 A group of women in Blantyre town centre wearing different cloths of the Evangelical Church of Malawi, 1 April 2014. The most challenging element of the fieldwork plan, and one I most wanted to achieve, was organising an appointment to meet with the designers of these cloths, which are produced at the DWS Mapeto factory in Blantyre. After several attempts, a brief thirty minute visit was agreed, limited due to the high work load of the design studio and timed to the minute! However, the visit resulted in an extremely valuable overview of the process of design from original customer’s sketch to finished full scale design, which is then passed to the machine engravers to produce the design plates for printing. A particular highlight was a quick look through the design catalogues which document each new numbered design. The designers gave us insights into the difference in working practice pre and post computer technology. This radically altered the design process and the number of staff in the office, which dropped from twenty to just four. 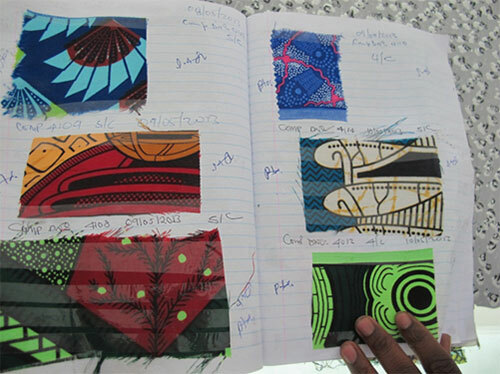 A page of the cloth design catalogue, each pattern given a unique design number, at DWS Mapeto Factory, Blantyre, 4 April 2014. The church and political cloth are sub-sets of the more decorative and widely used multi-coloured kitenje made and worn in Malawi. Whilst most are worn as a wrapper or tailored into a skirt and blouse outfit, they have also provided inspiration for Malawian fashion designers with an eye for the individual. I read about Eva Gertrude Kapanda in an online newspaper article and went in search to talk to her about how the chitenje cloths inspired her work. 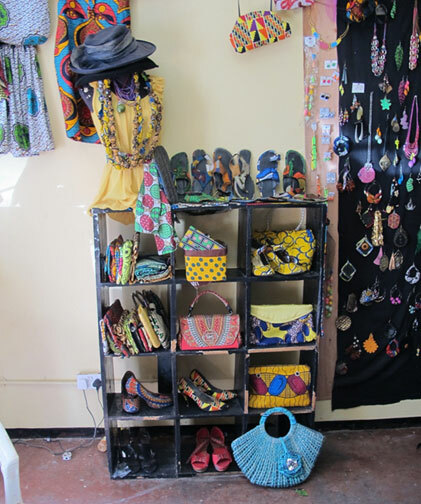 I located her in her small studio shop premises in Blantyre, which is bursting with creations, from original one-off dress designs to bags, shoes and earrings from the second-hand European clothing market in Blantyre, which Eva reinvents or recycles by covering with brightly patterned chitenje. Like others I met she was very interested and enthusiastic to hear about this research. This was a great ending to a fascinating visit and I returned to National Museums Scotland with a number of originals from her studio to add a further contemporary dimension to the study and to the museum collection. Eva Gertrude Kapanda chitenje designs, Blantyre, April 2014. An exhibition at the Museum of New Caledonia has told the story of the Reverend James Hadfield and Mrs Emma Hadfield, and their 40 years as missionaries in the Loyalty Islands. This exhibition included 13 artefacts from National Museums Scotland’s Hadfield collections, and is the first to look in detail at Loyalty Islands history and culture. Poster advertising the Hadfield exhibition at the Museum of New Caledonia. In 1910 James and Emma took a year’s break from their work in the Pacific and returned to Great Britain to stay with their son, James Arthur Hadfield, minister of the Kirk Memorial Church and resident in Edinburgh. Whilst in Edinburgh they offered a ‘Collection from New Caledonia and the Loyalty Islands’ on loan to the Royal Scottish Museum (now the National Museum of Scotland). It was displayed in the Ethnographical Gallery, before being purchased for the museum’s permanent collection, where it remains today. In fact, two collections related to the Hadfields were placed on loan to the museum in 1910. 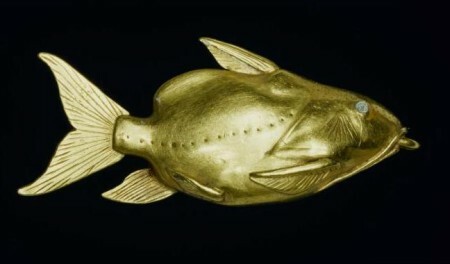 The first, described as a ‘Collection from South Seas’, comprised 105 artefacts and arrived in the museum on 26 February. It was registered as being from the Reverend James Arthur Hadfield of Edinburgh, the son of James and Emma. This is presumed to be a collection given to her son by Emma Hadfield, as the original entry in the Loans Register cites ‘Mrs Hadfield’ as the source. The year 1910 was a significant one for missionaries in Edinburgh. For 10 days in June the city hosted the World Missionary Conference. The collections on display in Edinburgh would immediately have been seen by the global missionary community, as a reception for delegates and their guests was hosted at the museum and attended by over 4,000 people. The original loan remained with the museum until 1962, when James Arthur Hadfield, by now approaching his eighties, contacted the museum. After a short correspondence, the museum returned the collection to him in good order. It is probably at around this time that the artefacts were dispersed amongst the family, only to be reassembled nearly 50 years later and gifted to the Museum of New Caledonia in 2009. Today the only evidence of the time spent at National Museums Scotland are fragments of the loan labels glued onto the objects. At the time of the purchase of the second loan, three finimeciwe necklaces of jade stone beads decorated with flying fox hair strands were held back from the purchase and remained on loan. Over the years the museum lost touch with the family and they became unaware of the continued existence of the three necklaces. 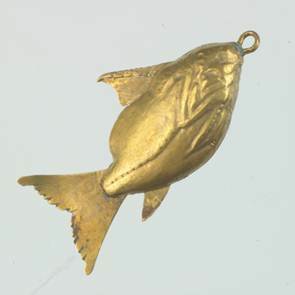 The Hadfield collection maintained its place in the museum’s public galleries, surviving redisplays in the 1920s and again in the 1970s, although by the 1990s only one necklace remained on display in the Wider World gallery, and as it was on loan the label clearly attributed it to the Reverend James Hadfield. The object and label were spotted by a member of the Hadfield family during a visit and contact with the museum was renewed. Three finimeciwe necklaces were on loan to National Museums Scotland between 1910 and 2008, when they were returned to the Hadfield family. 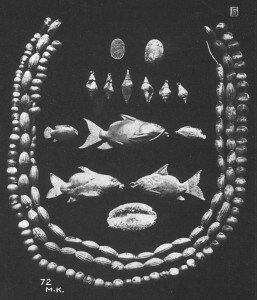 Visits from different family members over subsequent years and discussions on the cultural value of the necklaces led to their return to the family in November 2008, and in turn the gift of the Meciwa, along with many more items, to the Museum of New Caledonia. 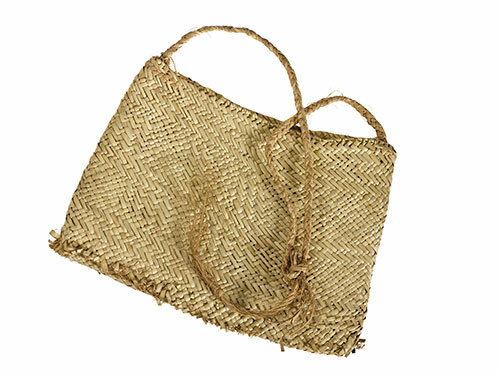 Oblong bag of plaited pandanus leaf with a carrying string, on loan from National Museums Scotland to the Museum of New Caledonia. Rotary drill consisting of a wooden spindle with a point of flint, and a wooden bow with coconut fibre string, on loan from National Museums Scotland to the Museum of New Caledonia. 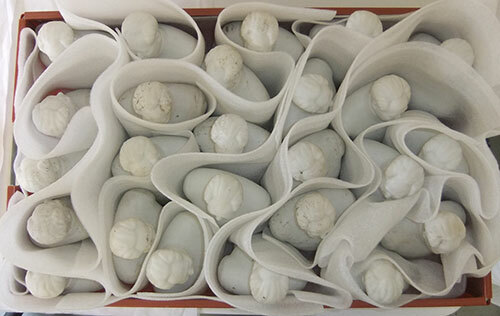 This gift was of such significance that the Museum of New Caledonia immediately began researching the collection in order to put on a special exhibition. The Hadfield family’s gift had increased the national holdings of Loyalty Islands artefacts from less than 10 historic items to over 100. The finimeciwe necklaces had found a wonderful new home. 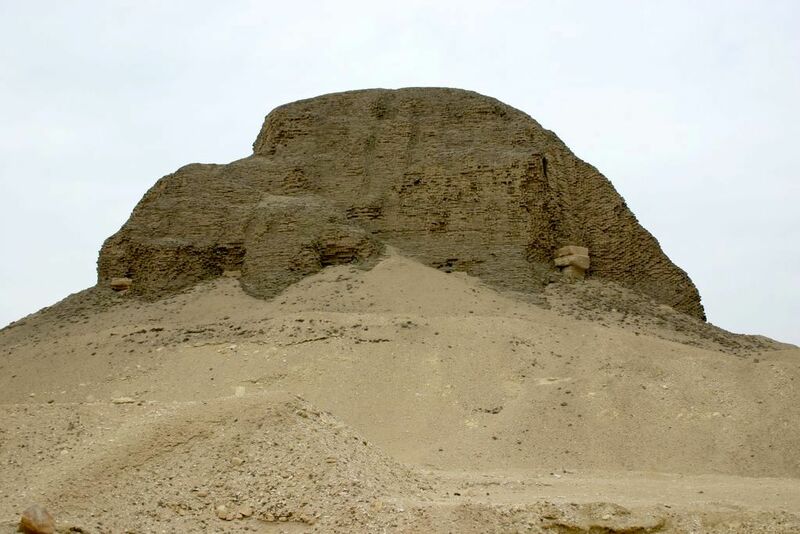 The planned exhibition sought to place the family collection on display along with some of the best pieces from National Museums Scotland and British Museum collections. Last September I travelled with Jill Hasell of the British Museum to the Pacific to courier the exhibition loans to the Museum of New Caledonia. 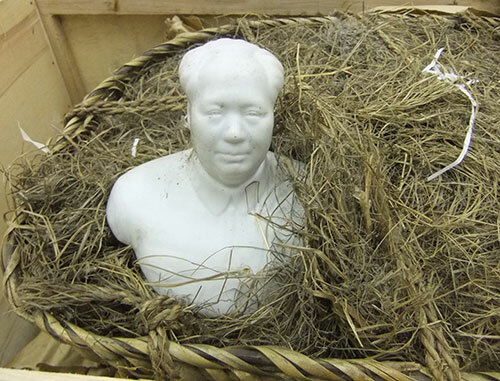 Over an intense week objects were unpacked, condition checked, mounts made and installed in the exhibition cases. As each case was completed with the help of the staff of the Museum, many of whom are Loyalty Islanders, there was a real excitement about having the collection on display for the first time. At the opening a group of dancers led guests of honour Douglas Hadfield, grandson of the missionaries, now in his nineties, along with his wife and two children into the exhibition, serenaded by the local church choir who sang a newly-composed hymn dedicated to the life of James and Emma and their work in the Loyalty Islands. 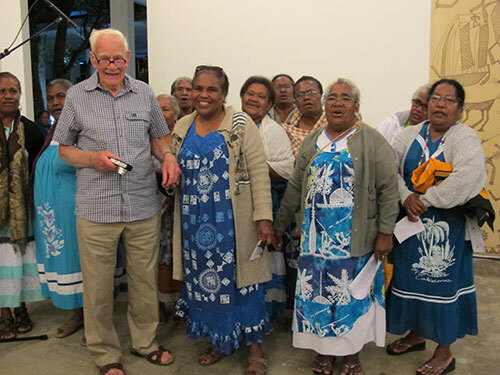 Douglas Hadfield, grandson of the missionaries, was guest of honour at the exhibition opening in New Caledonia. 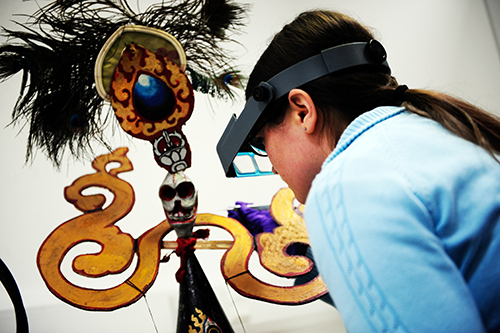 For National Museums Scotland this loan has provided a rare opportunity to lend artefacts to their country of origin, reconnecting them to the place and the descendants of their makers, and to gain access to new research and interpretation of the artefacts. It has also been a chance to reconnect with the original collectors’ family and learn more about their history. As a result the objects will return to Scotland with enhanced documentation, including the local names for all the objects and further information on their use, which will be added to our collections database. Historically National Museums Scotland always took in long-term loans as they provided an excellent opportunity to broaden the scale and scope of the collections on display, and safeguard material whilst funds were sought for their purchase or lenders were persuaded to become donors. What makes this collection so special are the ongoing connections between the Hadfield family and Loyalty Islanders. 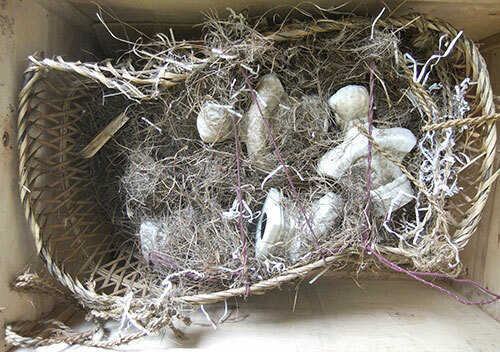 Their collections have created a network of objects and people that connect forever the institutions that house the collections with each other and the Loyalty Islanders, enabling further research and greater access to the collections. At the National Museum of Scotland we continue to display the Hadfield collection in the permanent gallery, Facing the Sea, reinterpreted and renewed for today’s audiences. 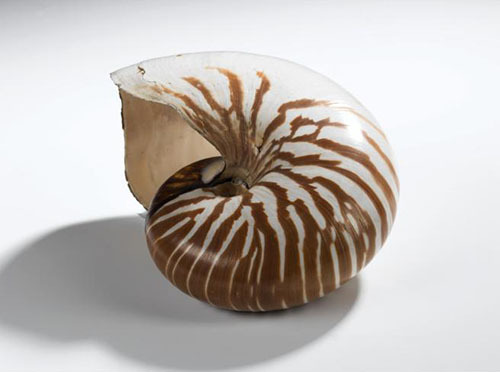 Nautilus shell, one of several objects from the Hadfield collection currently on display in the Facing the Sea gallery. 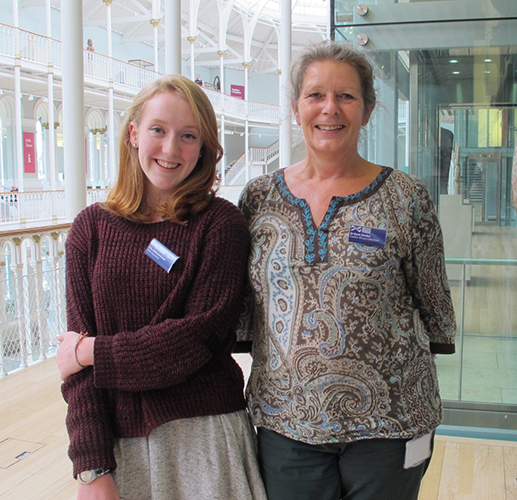 From September 2013 to January 2014, I held an intern position at National Museums Scotland, in the Department of World Cultures. My primary task was to continue the organisation and research of the Jean Jenkins ethnomusicology archive. The ethnomusicology collection of Jean Jenkins (1922-1990), was first established by the Royal Scottish Museum (now National Museums Scotland) in 1980, when the Museum purchased Jenkins’ personal collection of musical instruments and cultural artefacts. After Jenkins’ death in 1990, her rare sound recordings, photography, and paper archives were bequeathed to the Museum. During the internship, I was assigned the role of cataloguing, scanning and arranging Jenkins’ paper archive, which includes correspondence, field notes, pictures, and article publications from Jenkins’ career. 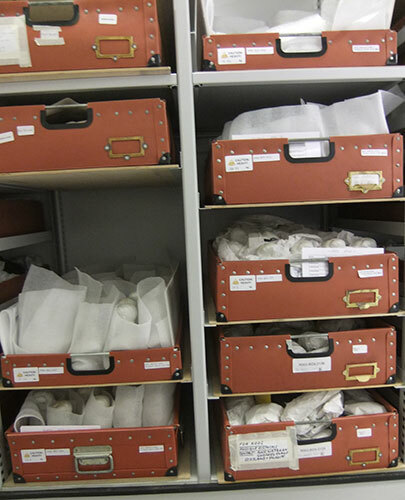 A wide portion of catalogue information has now been successfully grouped into folders for the Department of World Cultures and more importantly National Museums Scotland, to assist and promote further research and inquiry to relevant audiences. 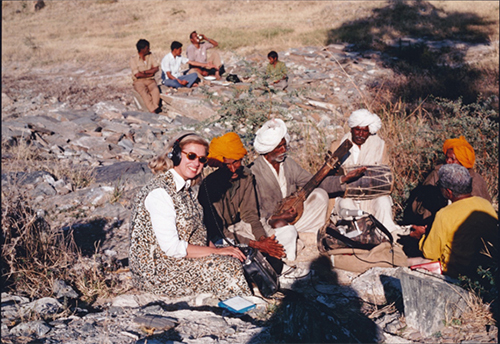 Jean Jenkins recording in Africa. Masenqo and male voice, Maychew, Ethiopia 1968. Jean Jenkins Archive © National Museums Scotland. Jalal Zur Funun plays solo setar, Tehran, Iran 1975. Jean Jenkins Archive © National Museums Scotland. Other aims of my internship placement included research on Jean Jenkins’ impact in the fields of ethnomusicology and the cultural heritage sector. The final outcome of this study will be published as an article for the Museum Ethnographers Journal. Whilst focusing on the primary objectives of the internship, I have also managed to take on subsequent research into African and Oceania archive material within the London Illustrated News, as a resource for the World Cultures Department. My residence at National Museums Scotland was an exciting chance for me to learn and gain valuable insight into the museum profession through the tasks I performed. This position has allowed me to think critically and engage effectively within the Department and in the public sphere, ultimately refining my abilities as a researcher. Furthermore, I am very grateful for the opportunities presented to me during these past few months, and the contacts I have made whilst interning with National Museums Scotland. Arriving at the National Museums Scotland staff entrance was a daunting experience. Turning up at the door at ten o’clock exactly with my packed lunch in my bag and my itinerary in my hand, I walked in and got my visitor’s pass ready for the day ahead. Soon after arriving I was shown into the office by Sarah Worden and introduced to everyone in the World Cultures department. I was shown my desk and given the museum newsletter to read for future reference. I was then set to type up a pamphlet for the recent Livingstone exhibition and my work experience began. One of my favourite parts of my time here was going down to the National Museums Collection Centre at Granton, where I got to see lots of items that are not on display. It was really cool going down there and observing the wide variety of objects the museum has and learning about their history. My time there was also made even more enjoyable by the great people who work there, who were happy to talk to me and show me what they were working on, despite their busy schedules. 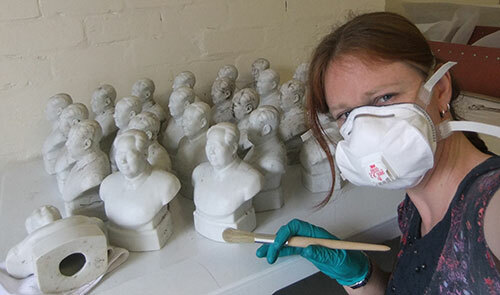 Conservation work in the National Museums Collections Centre. I also liked going to staff meetings as it meant I got a good insight into how a workplace functions and what is involved in bringing together such a large body of people to function in a correlating and amicable way. It was a great experience and I am very grateful to everyone who made it possible to give up their time and let me tag along with them and look in on what they were doing. Everyone was very friendly and I really feel like I have learnt a lot, both history and work wise. I’m very sad that my week here went so fast but who knows, I may be back in the not so distant future! Kitty with Dr Sarah Worden, Curator of African Collections. Rosina is curator of our past exhibition Kabuki: Japanese Theatre Prints, which ran at National Museum of Scotland from 4 October 2013 – 2 February 2014. 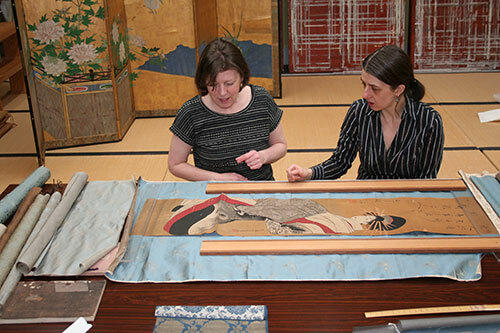 In April I travelled to Leiden in The Netherlands to deliver a Japanese painting to the conservation studio Restorient. The conservation work is being funded by the Sumitomo Foundation as part of their “Grant for Projects for the Protection, Preservation & Restoration of Cultural Properties outside Japan.” This programme is offered “so that cultural properties outside Japan, the common heritage of humanity, may be handed down to future generations.” Since 1998 hundreds of museums around the world have received money to help conserve their collections. Andrew Thompson and Sydney Thomson (yes, those surnames are different!) have been running Restorient Studio since 2005. They provide conservation of East Asian painting in all formats (screens, handscrolls, hanging scrolls), a kind of work which requires a very particular set of skills, and tools! ‘Processing Courtesan’, by Utagawa Hiromaru. In pre-modern Japan, paintings played a central role in the decoration of a room interior. 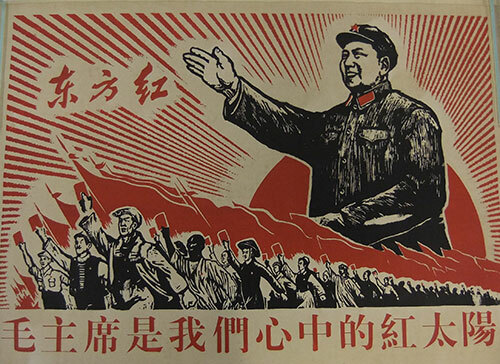 The most common format for display was the hanging scroll, which would be shown for a brief period of time and then rolled up and stored away. The subject matter was chosen to harmonize with the seasons or with a special occasion, such as a family member’s birthday. The Museum has a small, but growing, number of these hanging scroll paintings, but the work I delivered had been cut from its mount before it was acquired by the Museum in 1887, and so had never been displayed. It also had significant creasing and some water damage, so was well overdue for some TLC! The painting is done in ink and colours on paper, and measures 127.3 by 28.8 cm. The subject is a courtesan of the pleasure quarter, in Edo (modern-day Tokyo) dressed ostentatiously in several layers of kimono for the procession which took place from the brothel itself to the teahouse where the client was waiting. Edo was known as a “city of bachelors” because of the large number of young single men who lived there in attendance on the military regime during the sixteenth to mid-nineteenth centuries. There were several pleasure quarters where men could retire for entertainment and companionship. In the procession the courtesan would have been accompanied by attendants, the brothel owner and porters, but here the artist focuses on her alone. She wears an elaborate hairstyle, with long pins and a tortoiseshell comb at the front. The painter has sharply cropped the composition at left to convey the impression of movement as the woman sashays before the viewer. While well-educated gentlemen revile her. A playful inscription by Master Ko. The poem pokes fun at the moral criticism directed towards women of the pleasure quarters according to strict Neo-Confucian morality, and clearly expresses the poet’s approval of these beautiful and talented women. On my first visit to the conservation studio in Leiden we discussed the treatment that would need to be carried out on the painting. Then came the fun part, where we tried out various swatches of material, considering what would be suitable as the fabrics that will surround the painting surface and frame it visually. These need to harmonize with the colours in the painting, and also the motifs within the fabric should be appropriate to the subject matter. There were no final decisions at this stage, but we very much liked a pale blue colour with a wave motif, which worked well with the subtle wave pattern in the white robe worn by the woman. Examining the scroll in the Restorient studio. Over the coming months I’ll be posting with updates about the various stages of the conservation process, so watch this space!